Help us raise funds today! As you may have heard, a number of devastating typhoons hit the Philippines in September and October of this year. 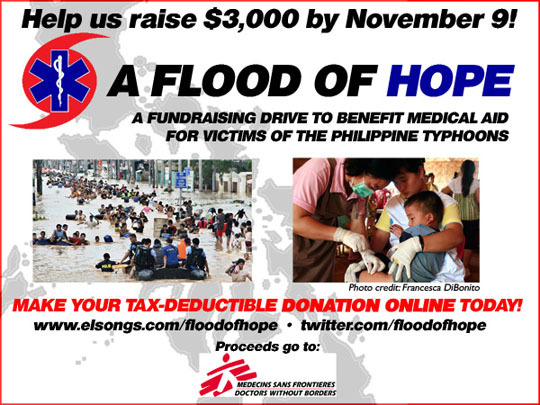 Since then, people have come forward with much-needed material and monetary donations for immediate aid, from the non-typhoon affected parts of the Philippines, to countries around the world. Over 500 people died in typhoons Ketsana (a.k.a Ondoy), Parma (a.k.a. Pepeng), Lupit (a.k.a. Ramil) and Mirinae (a.k.a. Santi). The typhoons themselves are long gone, and the flood waters are starting to recede, but the threat of additional casualties due to disease, infection and contaminated water supplies is very real, so this benefit addresses those concerns. In response to this tragedy, we organized a benefit concert in Los Angeles on October 24 and have launched a parallel ongoing fundraising drive for the month of October, which has now been extended to November 9 because of the recent typhoon. All proceeds will go to Doctors Without Borders (known internationally as "Medecins Sans Frontieres"), a reputable, worldwide medical aid organization that started in Paris in 1971. Since then they have responded to people most in need in warzones and places hit by natural disasters. Their work has even even earned them the Nobel Peace Prize in 1999. They have already started medical aid operations in the Philippines and have also noted that currently, people are suffering from diarrhea and skin diseases, due to exposure to bacteria- and toxically- contaminated water. Your contribution to our benefit isn't just giving someone a t-shirt or a blanket, it's literally saving people's lives.